Le Conte's Thrasher: Medium thrasher with plain gray or gray-brown body with paler throat and rufous undertail feathers. Eyes are dark. Bill is long, decurved, and black. Tail is long and dark. Legs and feet are black. Feeds on insects and their larvae, spiders, fruits and berries. Le Conte's Thrasher: Resident in deserts of southwestern U.S. from southeastern California, southern Nevada, southwestern Utah, and western and central Arizona to northwestern Mexico. Found in open desert scrub, alkali desert scrub, and desert succulent scrub. The Le Conte’s Thrasher was first described in 1851 by George Newbold Lawrence, an American businessman and amateur ornithologist. Satellite imagery shows that 26 percent of their historical breeding areas no longer have suitable habitat for this species. The palest of all thrashers, it was named for American entomologist John Lawrence LeConte. The Le Conte's Thrasher has a range of 250,000 square kilometers. 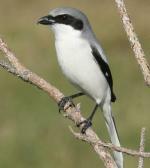 The population of this bird is estimated to be nearing 200,000 individual birds. 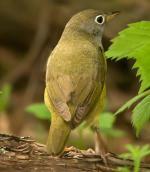 This bird is native to the United States and Mexico. This bird is currently rated as Least Concern. The previous rating for Le Conte's Thrasher was Lower Risk. 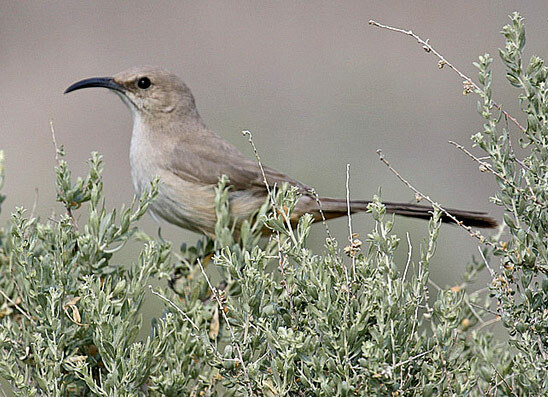 This rating was downgraded as a result of the stable population and range of Le Conte's Thrasher in 2004. At this time, there are not believed to be any immediate dangers or threats facing Le Conte's Thrasher.